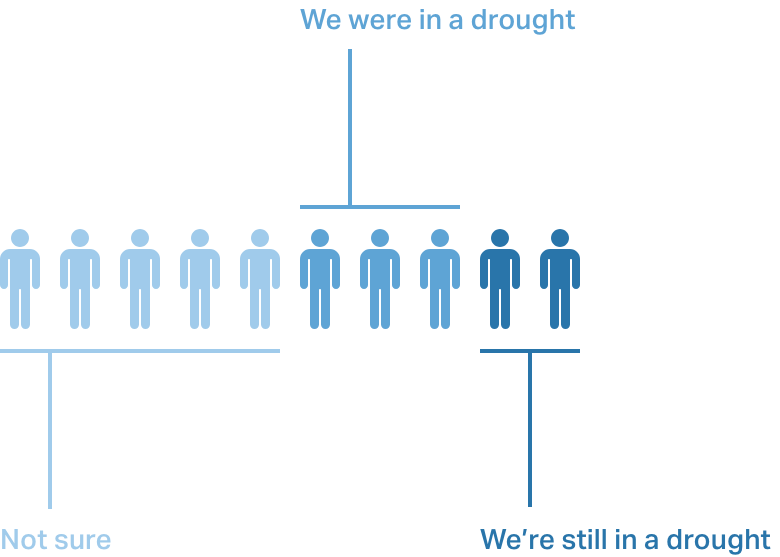 The Journey of Water is a project dedicated to understanding the drought situation in California. By examining impactful environmental factors in the ecosystem, we were able to identify leverage points in the system and propose a meaningful, long-lasting impact for more sustainable water usage. People are not aware/concerned of the drought & water situation in California. People who are aware of the situation and are making conscious decisions towards helping it feel like their impact is small compared to the problem. Raise awareness by making information more transparent, and taking action easier. Through our research, we found that water is used ubiquitously—especially in meats—and decided to focus on that because a lot of people are still unaware of the immensity of this issue. We also wanted to lower the barrier for people who aren't currently aware of the issue to take action, so they're not averse to it. Allow people to visualize the impact that they are contributing to. 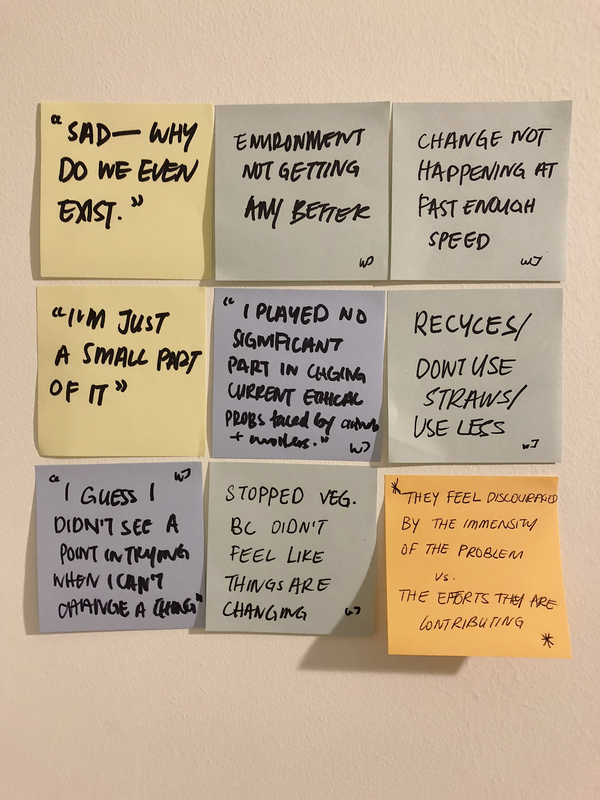 We feel that this is important because most of the people we interviewed feel like their impact is small and therefore won’t matter—which is a common myth. 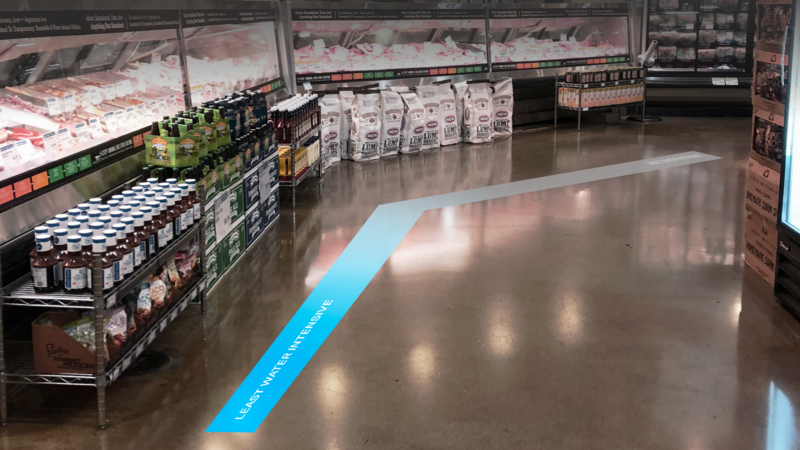 A four-part journey that aims bring grocery store customers along to raise awareness, change their behaviors and empower them to participate in water conservation efforts. Do you know the current drought situation in California? 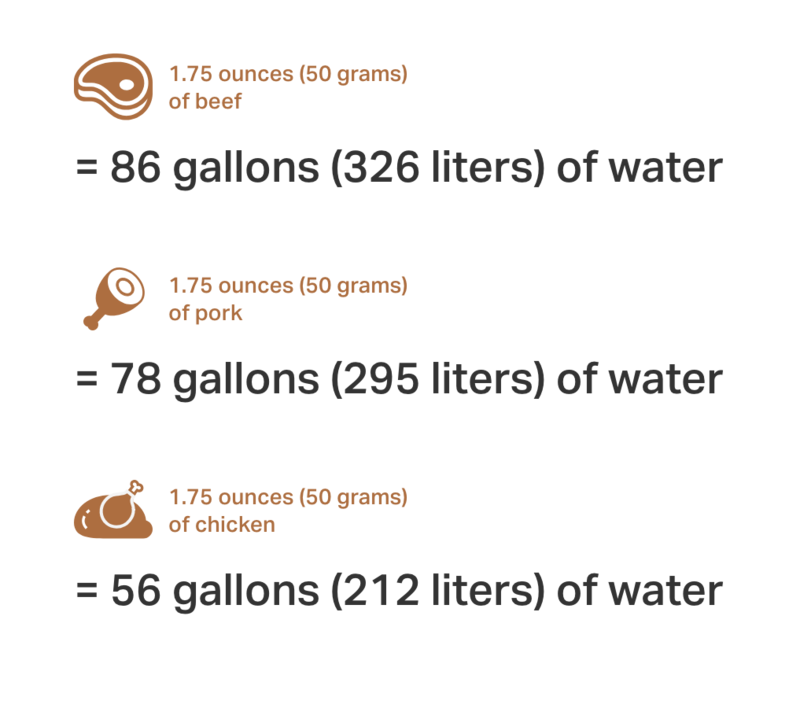 Do you know how much water it takes to produce meat? Even though drought seasons are stretching longer periods of time, and getting more extreme, only 2/10 individuals were aware that California is still in a drought. 90% of our participants were also unaware that meat production is an extremely water intensive activity. Which brings us to the problem that we were trying to tackle—raising awareness to the drought situation and encouraging the reduction of meat intake. From here, we discovered that many parts of our life need water. Some obvious, some hidden (diagram above). Even the products that we use everyday has hidden water footprint* involved with virtual water trades**. And the culprit contributing to massive water usage is Agricultural. * the amount of fresh water used in the production or supply of the goods/services used by a person or group. ** the hidden flow of water if food or other commodities are traded from one place to another. And the reason for the massive water consumption in Agriculture is because of the food we consume: Meats. The reason for this massive water usage lies in the food that the animals consume. Corn and soybeans—which are typically used to feed them—are extremely water-intensive. 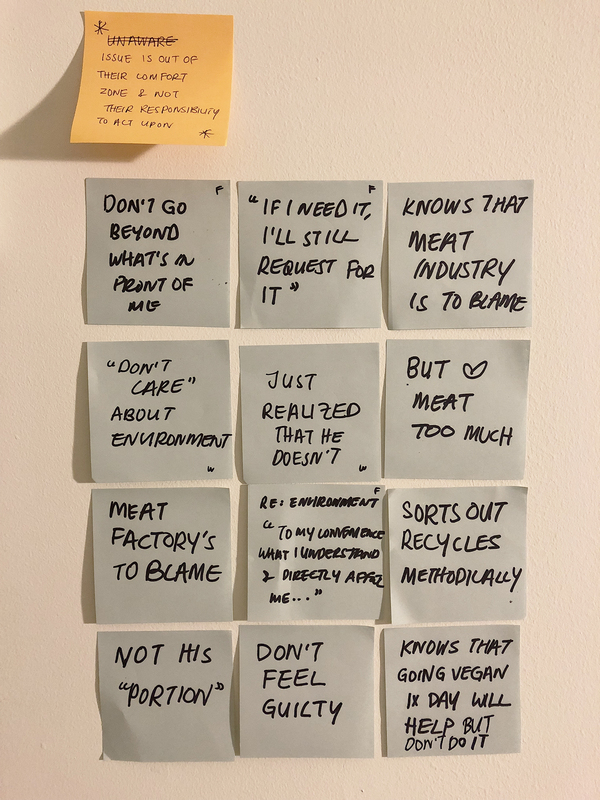 We interviewed four people of various dietary lifestyles—vegetarians and meat lovers—to understand their thoughts around food and impact. People don't feel the urgency, and don’t think it’s their responsibility to act upon or try to make change. There is an opportunity to educate people on the negative implications of their actions to the environment so they are more aware of the responsibility that they have. People feel discouraged because the problem is huge and their efforts are “small”. people to continue their green initiatives so they feel their contribution to environmental change is valuable. 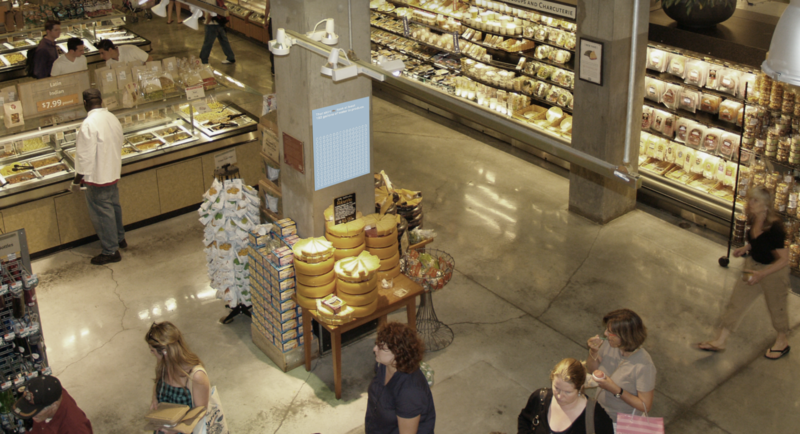 We think Whole Foods would be a great partner to collaborate with because our visions align. 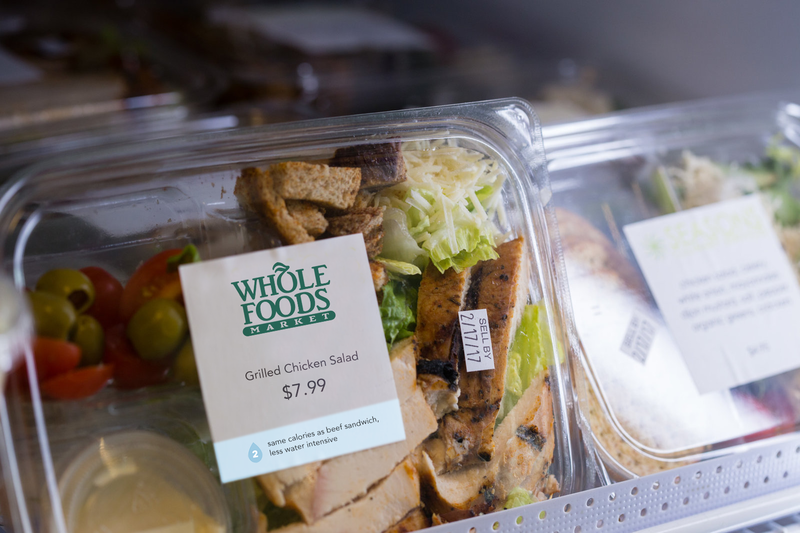 Moreover, Whole Foods has a close relationship with its food sources such as factories and farms, which would allow us to make significantly more impactful design solutions. 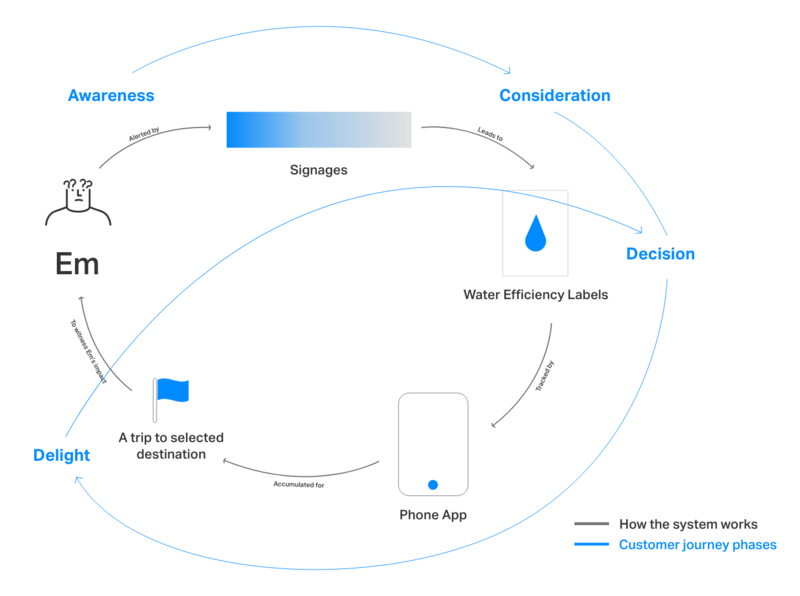 We examined how the flow of water, products and information gets to customers; and realized that if we can make this water usage information more transparent to customers, then they would be more informed and empowered to make an impact and influence the industrial chain backwards. We then observed and learned that there are two types of grocery shopping customers. The first type of customers are Goal-Driven and have existing purchase goals. It's trickier to persuade them to choose differently, but awareness and acceptance might be achievable. 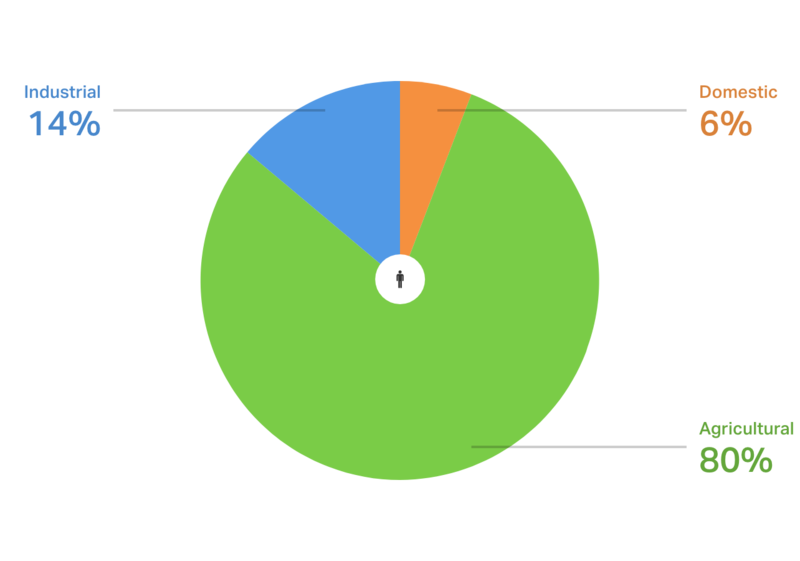 The second type of customers are Explorers and have no definitive purchase goals. We think there's more room to influence their purchase decisions. Subsequently, we mapped out their journey and looked for opportunities to intervene. Needfinding, Arrive at Store, Browse in Store, Check Out. We created a spectrum—Awareness, Acceptance and Action—to guide our customers through the learning of this important problem. We also wanted to make sure there's are touchpoints of varying impacts so customers can be exposed to this issue, and we can provide opportunities for them to take action whenever and with whatever level they're comfortable with. 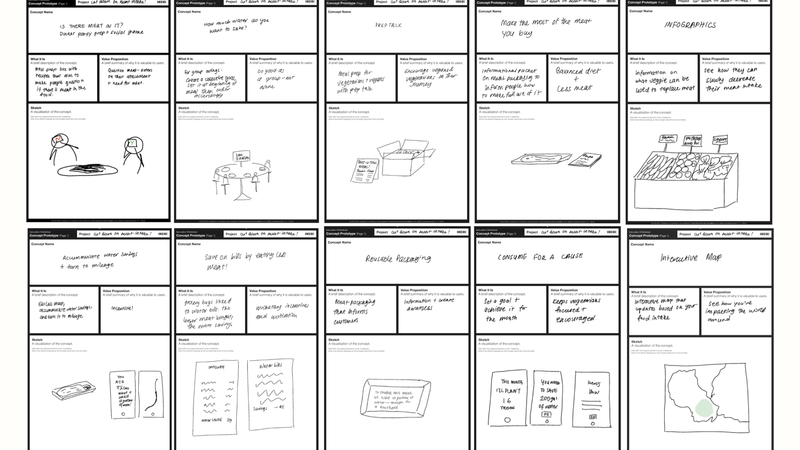 We came up with a total of 30 concepts, and sought for feedback from our peers. These were the selected concepts that had most positive feedback. Transparency of information & Visualization of Impact. 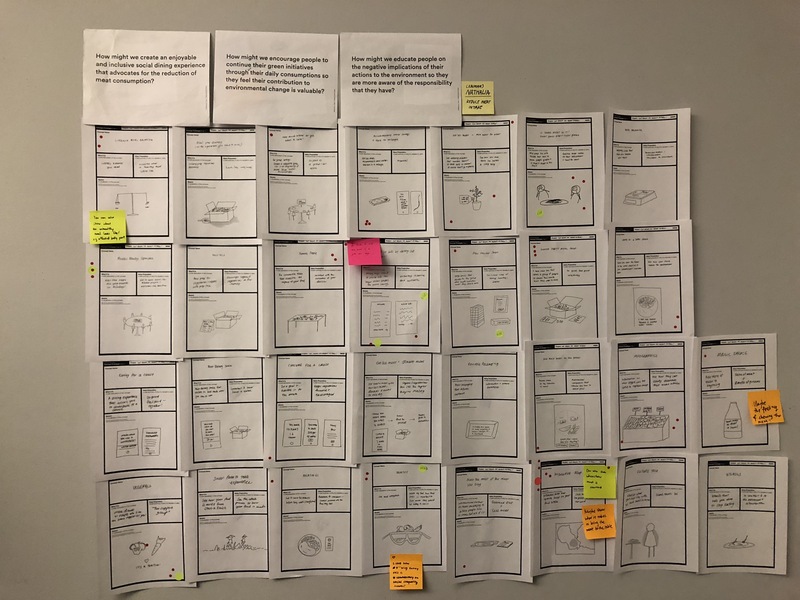 We then mapped our design solutions according to the spectrum and made sure there's an opportunity for customers to learn about this problem at each phase and take action should they be ready to. 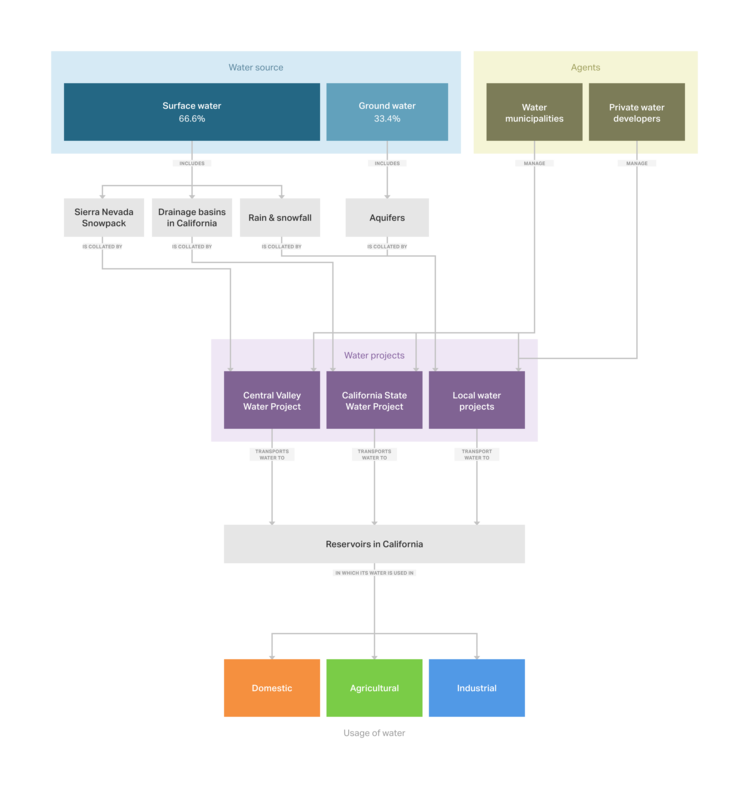 The following is a system diagram, and accompanying video to illustrate this journey and how each touchpoint incrementally adds contributes to the next. 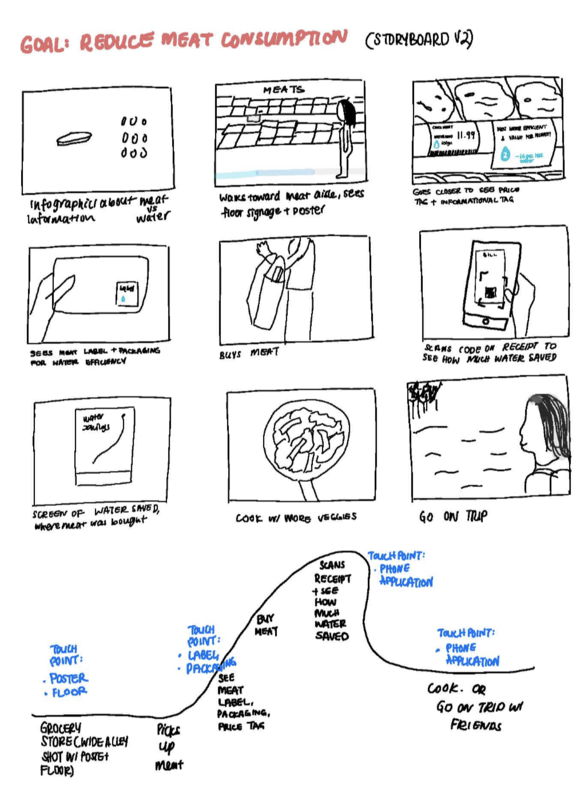 Below is a breakdown and closer look at each of the touchpoint at the different phase of the journey. Customers would be able to see posters all around the store that explains water usage in meat production, raising awareness for this issue. 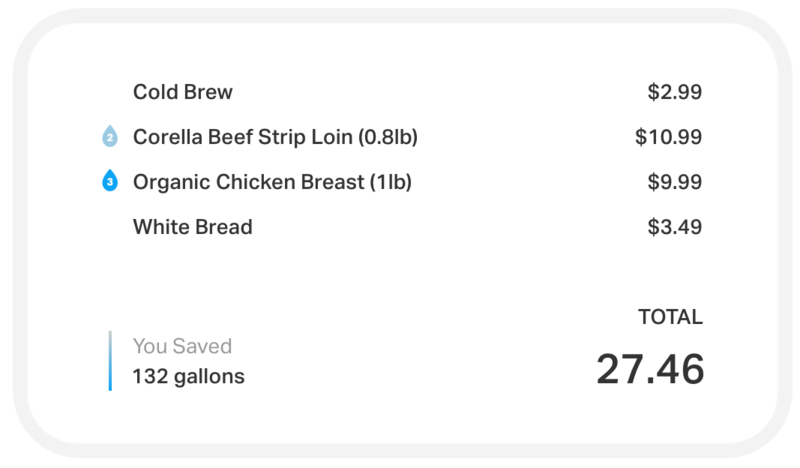 We believe that by putting water usage information on the labels, customers will be able to make more informed decisions. By using 1000 calories as a basis for comparison, we were able to compare the efficiency of water usage between different types of foods. 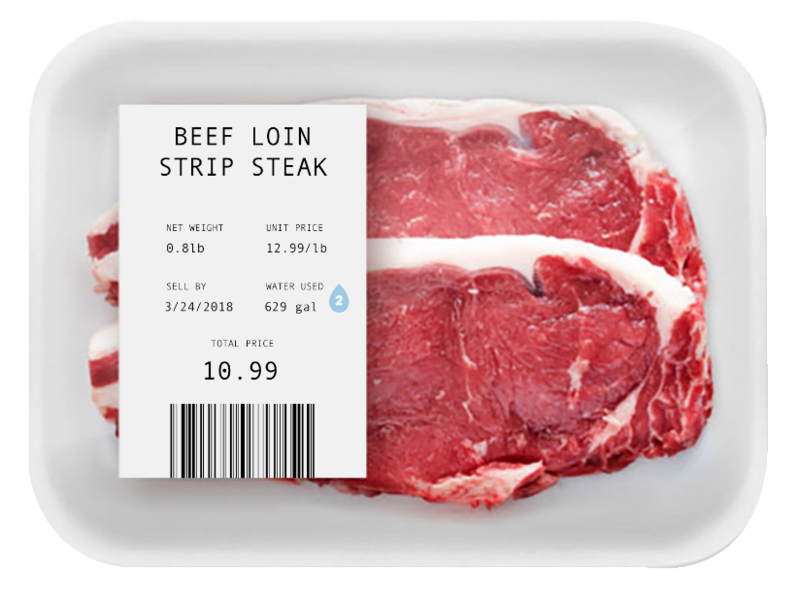 With this, we developed a water efficiency rating system which will then be reflected on the meat and food labels. 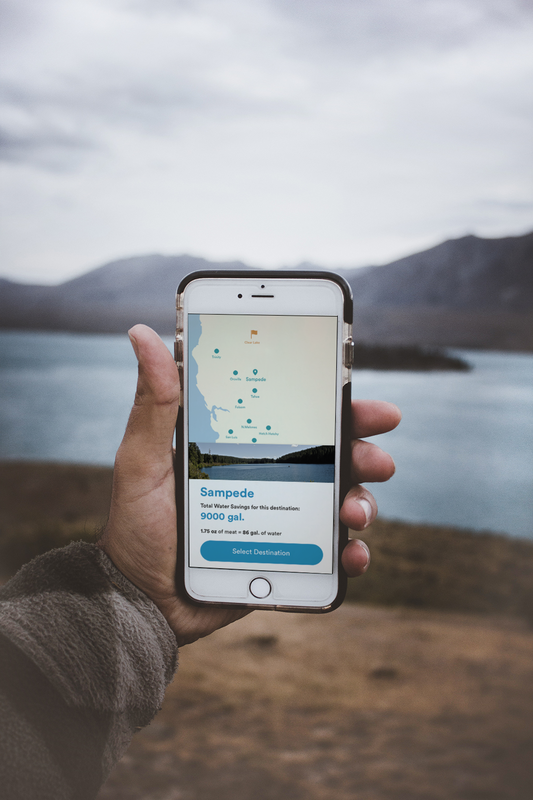 Customers will be able to create an account on the Flow app, and accumulate their water savings for a trip. We visualized it in the form of a journey, starting from where the customer is, to a national forest of their choice. This is so that customers are able to visualize their impact, and be encouraged to continue on the water saving journey that they have embarked on. Because of the complexity of the problem, we were aware of the need to be careful of our approach to the solution we're proposing. 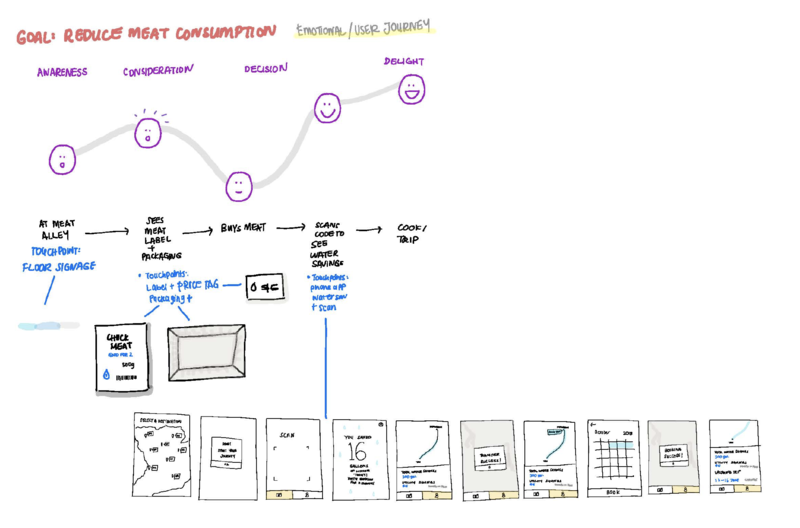 So, instead of focusing on an ambitious single solution, we thought that breaking it down and turning it into a journey would be more effective for behavior change. Through talking to people, I learned that trying to enforce change isn't the best way to enact change. I realized that small incremental steps that contribute to big changes can be more powerful.